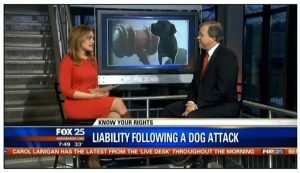 The law is “very cut and dry,” when it comes to liability for Massachusetts dog bite cases, attorney David White told Fox-TV Boston recently. White, a partner at Breakstone, White & Gluck of Boston, spoke on the network’s morning program about Milo, the Mansfield dog which attacked and seriously injured a 6-year-old boy on Jan. 3. The boy suffered severe facial lacerations and required more than 400 stitches. Last week, the Mansfield Board of Selectmen held a hearing and voted 3-2 to euthanize the dog. The dog’s owners said they planned to appeal the vote in District Court and were allowed to take Milo home after the hearing. Then, the dog attacked again, this time over the weekend on West Street in Mansfield, and ended up being euthanized before any appeal. In the second attack, the dog bit a 16-year-old teenager, who was sent to Hasbro Children’s Hospital to be treated for injuries. See news coverage. In the TV interview, White explained the process in Massachusetts for protecting communities from dangerous dogs. When someone is injured after a dog bite, the incident is reported to a local animal control officer, police or the Board of Selectmen. The board holds a hearing to determine if the dog is dangerous. It then votes on appropriate action, which may include muzzling the dog, restraining it, ordering it to leave town or other steps.The dog owner is allowed to appeal in the District Court. When someone is injured by a dog in Massachusetts, they can also file a lawsuit in civil court to recover damages under M.G.L. c. 140, Sec. 155. White said the law holds dog owners strictly liable for dog attacks, only providing a few exceptions. They include if an injured person is tormenting a dog or trespassing on another person’s property. Some states have a “one bite” or “first bite” rule, but not Massachusetts. When someone is injured, they are not required to prove the dog has injured before or that the dog is vicious. White advised dog owners to make sure they have coverage for dog bites and attacks on their homeowner’s insurance policies. If your insurer does not provide coverage, he says find another provider who does. Approximately 4.5 million people are bitten by dogs each year in the United States, according to the U.S. Centers for Disease Control and Prevention. Children are the most frequent victims, with those ages five to nine accounting for the largest numbers of injuries. With the return of the warm weather, many dogs are back outside with their owners in our neighborhoods, parks and yards. 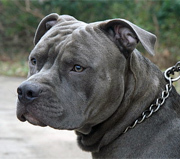 This is the time of year dog bites often occur, as dogs encounter unfamiliar people and environments. Dog bite injuries can result when dogs are not properly trained, do not receive the right care and are not prepared for social interaction. May 20 to May 26 is National Dog Bite Prevention Week, hosted by the American Veterinary Medical Association (AVMA). 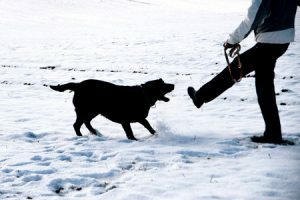 One of the organization’s messages is that dog bites and dog attacks are preventable if owners take the right steps to train their pets. Children are the most frequent dog bite injury victims. Of 800,000 Americans who receive medical attention for dog bites each year, approximately half are children. In 50 percent of dog bite cases involving children, the dog responsible belongs to a neighbor. Senior citizens are the second most common dog bite victims. On the job, more than 5,600 postal workers are attacked by dogs each year. Make sure your dog is licensed and has received all of its vaccinations. These are your most basic responsibilities. Always use a leash when walking your dog. This is a courtesy to other people you encounter and helps protect everyone. Select your dog carefully and take time to research the breed. If it is a puppy, ask to meet the parent dogs. Never obtain a dog on impulse. Make sure your dog is always wearing its tags with appropriate identification information. Ask your veterinarian if they suggest a dog training school. If you choose to use one, do your research. Seek out references online and ask the dog school owner for client names. Make sure your dog has opportunity for healthy interaction with other people and animals as a puppy. According to the AMVA, the first 6 to 14 weeks are critical to a puppy’s social development. The challenge is this is the time when a puppy is most vulnerable to illness so it is important to work with your veterinarian. Do not put your dog in a position where it feels threatened or teased. Make your home a safe environment for yourself, your dog, guests and neighbors. Consider fencing your yard. Make sure you have a door partition and a crate. Also make sure there are not any door or window openings which allow your dog to exit your home on its own. Your dog needs physical exercise and mental stimulation. Make time in your schedule to regularly walk and exercise your dog. Dogs can become bored and potentially destructive when left alone for many hours at a time. If yours is left alone all week, consider dog walking or daycare services for parts of the week. Avoid high-excitement games with your dog, such as wrestling. If your dog is showing signs of aggression, talk to your veterinarian and a dog trainer. If your dog bites or attacks someone, the injuries may be severe and long-term. You may also be held liable and have to pay damages. While dogs have long been considered “man’s best friend,” the sad fact is that approximately 4.5 million people suffer from dog bites each year. About one in five of those bitten require medical attention for personal injury. Even seemingly friendly, mild-tempered canines can suddenly become agitated in certain situations or with certain individuals. However, there are actions you can take to decrease the odds of a serious dog bite. Don’t allow your dog to roam outside without a leash. Never leave your dog unattended with a young child or baby. Don’t play rough/aggressive games with your pup. This can inadvertently teach aggressive behaviors. Plan social activities into your pet’s schedule–like walks in the park or dog play groups. If your pet does develop aggressive behavior, seek professional advice immediately from a veterinarian or trainer. Don’t attempt to pet a dog through its fence; seemingly friendly dogs are often territorial. Always ask the owner before reaching to pet any canine. If you meet an unattended dog, do not shout or run. If the dog approaches you, avoid eye contact and remain motionless until the dog passes by. Do not approach a dog that is eating, chewing a bone, or sleeping. Teach your children appropriate dog interaction skills. Massachusetts has laws that make dog owners strictly liable for injuries caused by their dogs, as long as the person who was bitten was not teasing, tormenting or abusing the dog, or not trespassing at the time of the bite. Ordinarily, these injuries are covered by insurance, although some insurance companies have begun to limit coverage for certain breeds of dog. If you are a dog owner, you should make sure injuries by your pet are covered.